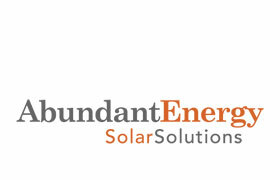 Abundant Energy’s previous logo and tagline needed a refresh in order to adapt better to a digital world. For brand continuity, we retained the general font type, used similar but brighter, fresher hues of orange. To simplify the messaging further, we rewrote the tagline from “Tomorrow’s Energy, Solutions Today!” (mostly because everyone was unsure why the comma had been used) and now it is simply “Solar Solutions”. Other work we’ve done for Abundant Energy, Inc.